Your forefoot is made up of many bones, all of which are important for supporting your weight and helping you push off the ground to take a step. Five of these bones, your metatarsals, make up the bulk of your forefoot and handle most of the pressure. A metatarsal fracture dramatically and painfully weakens your whole foot and inhibits your ability to even put weight on that limb, much less walk around. Your foot has five metatarsal bones that connect the arch of the foot to the toes. They take up a significant portion of your forefoot and carry a lot of weight when you stand and walk. Like any other bone in your body, though, they have their limits. Too much pressure or abnormal stress can break them. Typically these fractures are the result accidents. You might drop something heavy on your foot, or fall and land incorrectly. An abnormal twist or kicking a solid object too hard might break something as well. Even a severe ankle sprain could cause enough damage that it breaks your fifth metatarsal. When you do develop a metatarsal fracture, no matter which of the five bones it affects, you will feel pain. Normally the pain is strongest right around the break, particularly when you try to stand or put weight on that limb. Your foot will swell up—possibly quite a lot—and begin to bruise. You may or may not still be able to walk. Your forefoot needs immediate care to encourage healing and eliminate your pain, too. Stress fracture – This is a simple crack in the bone that doesn’t cut all the way through. Unlike other breaks in your forefoot, this is an overuse problem that develops over time. You might not notice the pain right away, either. Instead, your discomfort will grow as you continue to stand and walk around. Acute fracture – This is any type of break that cuts all the way through a bone. In your metatarsals, it can develop at any place along their long, thin shafts, though near the arch or the ball of the foot both tend to be common places. An acute break can be aligned so the broken ends are still in place, or it could be displaced, which can add complications to your recovery. Avulsion – This typically occurs with a severe ankle sprain and affects the fifth metatarsal, which connects to your littlest toe. The ligaments attached to the outside of the fifth metatarsal get pulled and stretched suddenly. As a result, they end up breaking off the small part of the bone they’re connected to, up near your arch on the outside of your foot. Jones fracture – This injury also impacts the fifth metatarsal. 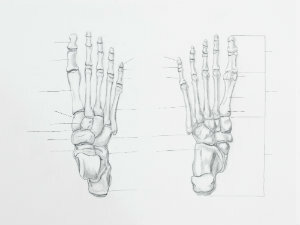 It is a complete break at a narrow place near what is called the metatarsal’s base, which is where the bone widens and connects to the arch of your foot. This can happen when you suddenly twist your foot too hard. Because this spot tends to have a lower blood flow than others, it can have trouble healing properly. Metatarsal fractures are treated much like any other broken bone. Dr. Noah Levine will examine your foot and use diagnostic images like X-rays to identify the break and how severe it is. Any displaced bones will have to be maneuvered back into place, which may or may not involve surgery. The bones then have to be immobilized in a special boot or cast, while you avoid putting weight on that foot. It will be several weeks, but after your bone tissues have sufficiently healed, you’ll be able to begin exercises to restore your foot’s strength and range of motion. Like any other broken bones, your metatarsals need prompt care to heal. Don’t wait and risk chronic pain or other complications keeping you off your feet and away from your favorite hobbies. If you’re at all concerned you might have a metatarsal fracture of any kind, contact our experts at Absolute Foot Care Specialists in Las Vegas for help and healing today. Call (702) 839-2010 or use our online forms to contact us for more information or an appointment.